The Islands of Koh Phi Phi (there are six) shot to fame in 2000 as the setting for the film "The Beach", the horrific events of the 2004 tsunami left them devastated and today, life has almost returned to a pre- Millennium equilibrium. The islands both love and loathe tourism, visitors are essential however, this former paradise on earth can no longer boast deserted beaches. The two largest Islands are the most popular, Koh Phi Phi Don and Koh Phi Phi Leh both are a favourite with divers and snorkelers. Boat trips tour the islands daily and vary from crowded motorboats full of noisy backpackers to more exclusive yachts for smaller groups and private tours . 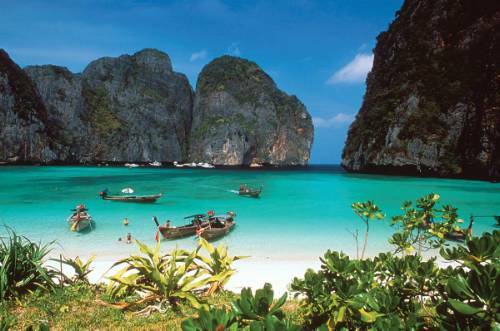 Koh Phi Phi Leh has two beautiful beaches, the most popular being "Maya Bay" which is where the film was set. It's crazy to come to Phi Phi and not see Maya Beach, it is utterly beautiful but far from empty! Early morning is the best time to visit, the beach should be quiet and you stand a better chance of obtaining an un-spoilt photograph. This is also a great time to explore the beach caves which also feature in the film. Koh Phi Phi is incredibly laid back, there are no cars on the Islands just a few motorbikes, some with retro sidecars. Nowhere is too far to walk or cycle and most visitors hire bicycles and use water taxis to hop between the Islands. Koh Phi Phi Don is the only one that is populated and this is where you'll find a small selection of resort style hotels and shops to stock up on bottled water and other essentials for the beach. If visiting the villages it is respectful to cover up, as many visitors don't realise that although very relaxed in so many ways, the main religion of the islands is Islam. There are a few attractions for sightseers, the shaded tsunami memorial gardens are a lovely place to reflect and many visitors climb up to the view point to experience the extraordinary panoramic view of all of Koh Phi Phi. Koh Phi Phi isn't the easiest place to reach, and there are various, bus/boat and train/bus/boat options. The quickest and easiest way is to fly to Phuket and pick up one of the high speed boats that take around half an hour pier to beach. Extending a trip from Bangkok is very straight forward, fly from Bangkok to Phuket in under an hour and pick up one of the boats. In high season I believe there are 13 flights a day between Bangkok and Phuket with Bangkok Airways.